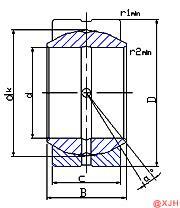 ​Spherical Plain Bearing Gez.ES Series is a slotted joint bearing product. Slotted joint bearings have a small stress gap on the outer ring, which is usually the crack groove. In the process of fitting the sleeve, the outer ring must be firstly subjected to cracking, and the outer diameter is pressed on the hydraulic press or the punching machine to cause cracking at the stress notch to form a through crack, and then the sleeve is formed to form a single product. Spherical Plain Bearing Gez.ES Series is a slotted joint bearing product. Slotted joint bearings have a small stress gap on the outer ring, which is usually the crack groove. In the process of fitting the sleeve, the outer ring must be firstly subjected to cracking, and the outer diameter is pressed on the hydraulic press or the punching machine to cause cracking at the stress notch to form a through crack, and then the sleeve is formed to form a single product. After the Spherical Plain Bearing Gez.ES Series is installed, it will be an integral part of the machine. We should not only consider the bearing itself, but also whether the bearing will conflict with other parts of the machine and whether the lubricant can smoothly enter the bearing. In addition, we also need to check whether the radial clearance of the bearing, the tightness of the bearing and the shoulder, the noise, temperature rise, vibration and other parameters are within a reasonable range.